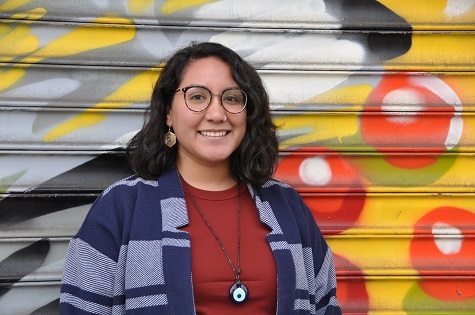 Genesis Abreu is a queer woman of color with Mayan indigenous roots and Salvadoran and Dominican ancestry from Inwood and Washington Heights, an environmental (in)justice neighborhood in New York City. Her work is rooted in the intersection of environmental, climate, gender, and language justice. As the Bilingual Community Organizer and Outreach Coordinator at WE ACT, Genesis recruits, engages, educates, and mobilizes monolingual Spanish-speaking and self-identifying Latina/x/o community leaders in Northern Manhattan to actively participate in local, state, and federal decision-making processes on key health, climate, and environmental issues. Most recently, Genesis was a co-project manager for the “NYCHA Villages Project,” a tenant-created vision for an environmentally resilient, sustainable, and healthy NYC public housing. Prior to WE ACT, Genesis worked exclusively on community participatory research efforts in Latin America. Most notably she was awarded a Fulbright Research Grant in 2016 and worked alongside Quechua indigenous farmers from the Potato Park in Cusco, Peru to study the social, environmental, and economic implications of climate change on potato production. Genesis has a B.S. in Environmental Science from Marist College and is currently pursuing an M.S. in Environmental Policy and Sustainability Management from The New School.